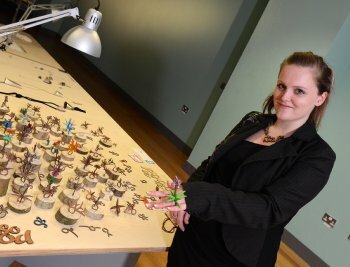 TALENTED Ulster designer Laura McLaughlan has picked up a top award for craft innovation for her clever range of sustainable floral jewellery. “The collection of rings depicts exotic flowers and other colourful seasonal blooms that I sold in my flower shop”. Joe Kelly, Director of Craft NI said: “Laura has received this prestigious award because she has taken a fresh look at jewellery design and has demonstrated great potential for new craft markets”. “I commend the creativity and entrepreneurial spirit demonstrated by our emerging craft designers who have shown they have the capabilities to be successful in the business world. • The Craft in Business Award is a jointly funded award by Craft NI and Invest NI. The purpose of the award is to highlight the opportunities for application of creative practice to business innovation and entrepreneurship within the creative and cultural industries sector. • The Craft in Business Award is presented to a final year student in applied arts at the University of Ulster whose work demonstrates the most potential demonstrates potential for innovation and application to entrepreneurial business.